Trenton-Morrisville Bridge over the Delaware River. 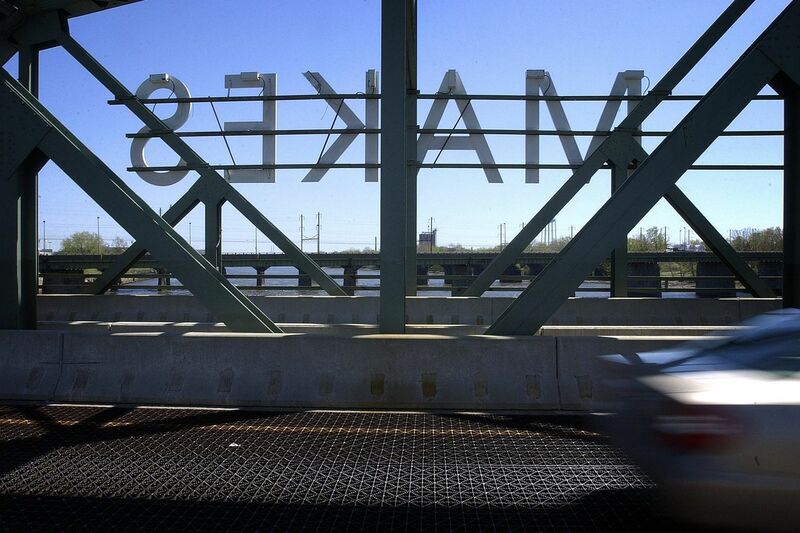 Every weeknight I go across the bridge linking Morrisville with New Jersey's capital, and turn left to glance at the larger-than-life lighted sign that blares, "Trenton Makes, the World Takes." It's a not-so-subtle nod to the days when the city hummed with industry, when Roebling made the steel that made bridges around the world, and royalty ordered its china from Lenox and Boehm; when folks from all over would come downtown to shop, eat, and wander. After more than 30 years living there, I've come to love Trenton. Those of us who have championed the city can't figure out why it struggles to successfully reclaim its storied past when its location suggests that it should be bustling, given at the very least its mass transit and highway systems. No doubt a lot of it is the faulty perception that Trenton is a dangerous place with desperate people. That perception persists despite neighborhoods, some with trees and historic homes, that house people with hopes and dreams; despite the fact that thousands pour into Trenton Transit Center each morning to catch trains headed north and south, or attend a ball game at Arm & Hammer Park, where the Trenton Thunder play, or venture to the Cure Arena to see their kids graduate from high school or attend a concert. There are more than a few signs that Trenton may actually be on the rebound after decades of public announcements that this or that company had decided to relocate here or build a new high-rise — and then have the pronouncement fizzle. Now, more than a few market-rate housing developments have emerged, and immigrants from Latin America and West Africa have claimed houses, restaurants, shops and churches once run by immigrants from Europe that followed their customers and families to the 'burbs. Even the New York Times wrote recently about things to do during a day trip to Trenton. My wife, Angela, and I cheered the mention of some of our favorites, including the 1911 Smokehouse Bar-B-Que. Starbucks has a brand-new spot downtown and Settimo Cielo, a northern Italian restaurant, endures for a great meal and as the spot to witness late-night hobnobbing. One no longer assumes that a parking spot will be at the ready when you head downtown for an evening meal. This momentum helps explain why I blew a gasket Sunday morning when I learned that Trenton's signature Art All Night event became a crime scene shortly before 3 a.m. – one dead and almost two dozen injured. Police crime-scene tape keeps people away from the brick Roebling Wire Works building in Trenton hours after a shooting at an all-night art festival early Sunday, sending people stampeding from the scene and leaving one suspect dead and at least 20 people injured. Angela and I had been there just hours earlier with our two youngest sons, who have special needs. As parents, we are always thinking ahead about the potential perils of any event, wondering whether the crowd, the noise, the newness will be too much to process. No worries at this one. The vibe was so joyful, the art so varied, that it all seemed like a nonstop visual treat. Andrew's and Umi's faces and body language conveyed nothing but happiness. They both do art, so they saw themselves, I think, as a part of that art community. I couldn't help but think about the work of noted Yale University sociologist (and my friend) Elijah Anderson, who writes about how America often finds itself in racially divided spaces – and then there are public spaces. One of the amazing things about Art All Night is that it was very much a public space. There were tons of excuse me, I'm sorry, pardon me's as people, city and suburban, happily worked their way through the crowds. Now we must worry that the actions of an asinine few have threatened to set Trenton back, set us back. When violence breaks out in urban America, it reinforces both the conscious and unconscious notions of the so-called dark, violent heart of cities. If all hell had broken out in Yardley, folks would have explained it as an aberration. Well, it's aberrant behavior in Trenton as well. Trenton is so much more than this violence, and this city must continue to fight to have its humanity recognized and respected. That's my personal goal in big and small ways, to be a part of continuing to help Trenton find its way and its voice. I think of my neighbors who head out to work before daybreak. And the elderly gent who makes it his project to sweep two Hamilton Avenue blocks every day until they are immaculate. I think of my neighborhood dry cleaners. They speak little English and I speak no Korean, but we communicate flawlessly. And I think of my church family, many immigrants from West Africa, who have helped me recover my heritage simply by their example. We are worthy of nice things, like the art festival, and we will endure.